Location: On the headland at the NE corner of Angle Bay. 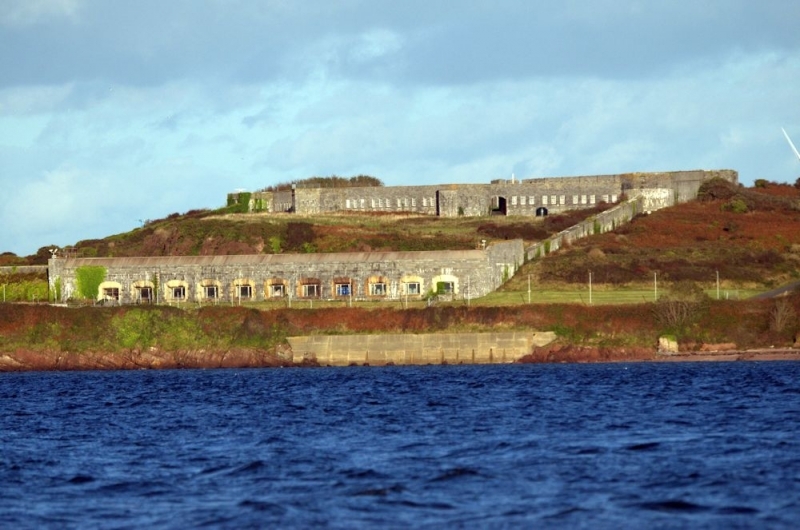 Commenced in 1859 and completed in 1864 as one of Palmerston's series of forts constituting the defences of Milford Haven, designed to function in conjunction with Hubberston as an inner line of defence. Two batteries and barracks. W facing battery modified in 1869 for guns with Moncrieff carriages; these dismantled in 1886. By 1903 the fort was no longer in military use. Re-occupied by RAF in World War II. Taken over in 1957 by BP as their Angle Bay Ocean Terminal HQ, and extensively renovated. Closed 1985. Now a field-studies research centre. The barracks at the rear of the fort are designed for 10 officers and 260 men. They are a six-sided figure with bastions at each corner. Entrance at NE originally over a drop bridge. This replaced by a rolling bridge, now also removed. Interior is a parade ground, now grassed, surrounded by intramural buildings. From entrance, clockwise, as shown on WD plan of 1887: Side 1: Canteen, school and library. Side 2: officers' quarters. Side 3: Wash house, hospital and staff sergeants' quarters. Sides 4, 5 and 6: Soldiers' quarters. Beside entrance: Guard room and cells. SW bastion contained latrines, now removed. W bastion contained coal bunkers, now removed, but lightning conductor over them remains. Apart from loss of the entrance bridge the barracks part of the fort is largely complete externally. There are minor losses including the original pitched roofs which have all been replaced by concrete and asphalt flats. Some sections of the fronts of the intramural buildings have been altered to form workshops. Windows and doors are modern in original openings. Batteries: Facing W: Moncrieff battery, with casemate gun emplacements below. Facing NW and N: Open battery. Loss of minor buildings to rear (shown on 1887 plan). Ground to rear of batteries has been quarried out for oil tanks, now removed leaving a shallow pool. Sally-port at W extremity of the S wall has a door fabricated of rolled wrought iron plate and sections reinforced behind with chain links. Below both batteries are underground arsenals now occupied by rare fauna. In the open battery two George III cannon were used as pivot blocks. One is in situ (the other restored and installed on Martello Tower in Pembroke). The masonry of the exterior and the frontages of the intramural barracks is random-coursed grey limestone ashlar with hammer-dressed face. Dressings of window, loophole and door apertures is in chisel-pointed finish. Chisel drafted margins generally to dressings and quoins. Bulging square cornice. Windows to officers' quarters in SE face are replaced sashes in original openings, with lintels and relieving arches. Masonry of W face towards the Haven is of high quality. Yellow granite dressings to all eleven casemate openings including flat voussoir arches. One aperture damaged by conversion to a gateway. Ashlar in large regular courses with chisel-drafted margins throughout and strong rustication. Half-round cornice. Listed grade II* as very well preserved fort of Palmerston's Haven defences of great technical interest and a structure of high quality despite some minor losses. Situated some 0.75 km NW of Rhoscrowther Church and close to Texaco Oil Refinery. Situated some 0.75 km NW of Rhoscrowther Church and close to Texaco Oil Refinery. C18 to C19 farmhouse attached to medieval tower. Situated in churchyard to N of N transept of Church of St Decuman. Situated in centre of village, in large churchyard. Situated in churchyard to E of church, fronting on to road. Situated at S end of village, S of bridge and W of road.